Please see the previous article at http://ponnadi.blogspot.in/2014/10/virodhi-pariharangal-40.html. We are continuing with thathva virOdhi from previous article. Most of these subjects require deep knowledge which is acquired through systematic study of sAsthram. To have full and in-depth understanding, it is best to learn these principles with the guidance of scholars. Not knowing that all changes/transformations of matter both within our aNdam (universe) and other aNdams (universes) outside ours, happen due to the will of a chEthana (sentient) is an obstacle. All achith (matter) inside our universe and other universes outside this universe (put together all these material universes are called leelA vibhUthi - samsAram) transforms/changes based on the will of parama chEthanan (bhagavAn - srIman nArAyaNan). chAndhOgya upanishadh says "thadhaikshatha - bahusyAm prajAyEyEthi" (ததைக்ஷத - பஹுஸ்யாம் ப்ரஜாயேயேதி) - let me see my variegated manifestation. Translator's note: srushti (creation) happens per the sankalpam (will) of bhagavAn who is the top-most chEthanan (knowledgable person). sruthi says, "nithyO nithyAnAm chEthanas chEthanAnAm" (நித்யோ நித்யாநாம் சேதநஸ் சேதநாநாம்) - The most eternal among the eternal ones and the most knowledgeable among th knowledgable ones. In many other places "bahu syAm" is referred and srushti is established as the outcome of the sankalpam (divine will) of bhagavAn. In thiruvAimozhi 3.2.1, nammAzhwAr says "munnIr gyAlam padaiththa em mugilvaNNanE..." (முந்நீர் ஞாலம் படைத்த எம் முகில்வண்ணனே...) - One who is like cloud (dark complexion and merciful nature)! - You have created this universe which contains 3 types of water. Here nampiLLai brings out the divine emotions of nammAzhwAr. He says that AzhwAr is thankful for emperumAn to have created this universe, so all jIvAthmAs including himself, will have suitable bodies, senses, etc., with which they can progress spiritually and finally be uplifted. But yet, AzhwAr highlights that such opportunity is wasted, since the body is simply used to satisfy material desires. From this, we can understand the divine will of bhagavAn which facilitates the upliftment of all jIvAthmAs through this creation. Not knowing that jagath (universe) pariNAmam (transformation) is adhvAraka bhagavadh sankalpa adhInam (under the direct control of bhagavAn's divine will) is an obstacle. Translator's note: As explained previously, there are two types of srushti (creation) - adhvAraka srushti and sadhvAraka srushti. adhvAraka srushti is the first step of transforming subtle matter into gross matter (upto the creation of universes) and this is done directly by bhagavAn. Subsequent creation of variegated forms/species are created by bhagavAn through brahmA, etc. Similarly, even during samhAram (destruction), first bhagavAn destroys the variegated forms/species in the universe indirectly through rudhran, agni (fire dhEvathA), etc. In the end, he himself directly consumes all gross matter and transforms them in subtle matter. This cycle goes on and on. Not knowing that all entities are bhagavadhAthmakam (pervaded by bhagavAn as their in-dwelling super-soul) is an obstacle. This is clear from nArAyaNa sUktham - "anthar bahischa thathsarvam vyApya nArAyaNasthitha:" (அந்தர் பஹிஸ்ச தத்ஸர்வம் வ்யாப்ய நாராயணஸ்தித:) - nArAyaNa is pervaded inside and outside of everything and holding everything together, "sarvabhUthAntharAthmA" (ஸர்வபூதாந்தராத்மா) the in-dwelling soul of all entities. Translator's note: brahmam (bhagavAn) is the in-dwelling soul of everything that exists. bhUtha is derived from the root "bhU saththAyAm" (பூ ஸத்தாயாம்) - that which exists. Anything that exists is held by bhagavAn. It is by his presence as antharyAmi that makes the object exist. sAsthram says "yasya AthmA sarIram, yasya pruthvi sarIram, ..." (யஸ்ய ஆத்மா சரீரம், யஸ்ய ப்ருத்வி சரீரம், ...) - jIvAthmA is body for brahmam, earth is body for brahmam, etc. Same principle is explained by nammAzhwAr in thiruvAimozhi 1.1.10 "parandha thaN paravaiyuL nIr thoRum parandhuLan parandha aNdam idhena nila visumbu ozhivaRa karandha sil idam thoRum idam thigazh poruL thoRum karandhengum parandhuLan ivai uNda karanE" (பரந்த தண் பரவையுள் நீர் தொறும் பரந்துளன் பரந்த அண்டம் இதென நில விசும்பு ஒழிவற கரந்த சில் இடம் தொறும் இடம் திகழ் பொருள் தொறும் கரந்தெங்கும் பரந்துளன் இவை உண்ட கரனே) - bhagavAn exists in small drops of cool water of the ocean as comfortably as living in a huge universe all by himself. Not knowing that all entities are favourable since they are pervaded by bhagavAn. As all things (sentient and insentient) are pervaded by bhagavAn, they are favourable only. Not knowing that certain objects are seemingly unfavourable due to us confusing the body with the self is an obstacle. It is only due to our ignorance of considering the body as soul leads to thinking about anything as unfavourable. Translator's note: This and the previous point are very related. Let us understand this a little bit. One who is truly realized about the nature of jIvAthmA will know that jIvAthmA is naturally blissful. This principle is beautifully explained by piLLai lOkAchAryar in thathva thrayam sUthrams 73 to 76 and elaborately explained by mAmunigaL in his vyAkyAnam. In sUthram 73, he says bliss is the happiness resulting from full expansion of true knowledge which is favourable for the true nature of jIvAthmA. In the next sUthram, he explains that poison, weapons, etc., seem unfavourable due to ones confusion of body with the soul, etc. mAmunigaL explains that one is scared of poison, etc., due to three factors - a) considering that the body and the self are same and something affects the body means it affects the self too; b) ones own karmA which influences the thought process (that associates the fear factor in poison, weapons, etc) and c) not having true knowledge that even poison, weapons, etc., are pervaded by the same bhagavAn who pervades the self and the body. In the next sUthram, he explains that since all objects are pervaded by bhagavAn, they are naturally favourable only and the concept of them being unfavourable is accidental. mAmunigaL quotes various pramANams (we have already seen some of them) to establish this principle. Finally, piLLai lOkAchAryar explains this principle with nice examples. In 74th sUthram, he says "If there is any other reason for objects being favourable (other than them being pervaded by bhagavAn), the same sandalwood paste, flowers, etc., which are favourable for a person in a particular time is unfavourable for the same person in some other time/place as well as unfavourable for another person in same time/place - this should not be the case". mAmunigaL explains it nicely. For a person, sandalwood paste is favourable during hot conditions. But for the same person, when it is cold, the same sandalwood paste is unfavourable. Similarly, for a healthy person in a hot conditions, sandalwood paste is favourable but in the same condition, if another person is suffering from fever, that same sandalwood paste is unfavourable. So, the cool nature of sandalwood paste by itself does not determine whether it is favourable or not - but it is assumed by the bodily condition of the person applying it. So, the real favourable nature is due it being pervaded by sandalwood and the assumed favourable nature is based on one associating himself/herself with the body. And when one has that true understanding of everything being body of bhagavAn - they will be naturally blissful in whatever bodily situation they are in. Not knowing that nithya vibhUthi (eternal spiritual world) is nithyam (eternal) due to the nithya ichchai (eternal desire) of nithya brahmam (eternal bhagavAn) is an obstacle. nithya vibhUthi means spiritual world - srI vaikuNtam. Unlike leelA vibhUthi which is created and destroyed contantly as part of material activities, as this is eternally existing without any material change, this is called nithyam (eternal). The fundamental reason for this is bhagavAn's sankalpam (desire). Translator's note: The nature of spiritual world - paramapadham is explained in various literature. vishNu sUktham says "thadh vishNOr paramam padham sadhA pasyanthi sUraya:" (தத் விஷ்ணோர் பரமம் பதம் ஸதா பச்யந்தி ஸூரய:) - In that supreme abode of vishNu, he is constantly seen by the nithyasUris. linga purANam says "vaikuNtEthu parE lOkE ... AsthE vishNurachinthyAthmA" (வைகுண்டேது பரே லோகே ... ஆஸ்தே விஷ்ணுரசிந்த்யாத்மா) - srIman nArAyaNan along with his consorts is served by many devotees in vaikuNtam. ALavandhAr explained the beauty of srI vaikuNtam in sthOthra rathnam. emperumAnAr explained the same in srIvaikuNta gadhyam. This paramapadham is explained as the eternal and spiritual abode of srIman nArAyaNan. Not knowing that the transformations of the aprAkrutha achith (divine matter) is purely happening out bhagavAn's desire is an obstacle. The achith (matter) that is seen in paramapadham is not the same as we see in our material world. It is divine matter that is sudhdha sathvam (pure goodness). Based on the desire of bhagavAn, it assumes various forms. Translator's note: piLLai lOkAchAryar explains these principles about paramapadham in great detail in thathva thrayam. It would be good to study that under proper guidance. Not knowing that the divine matter does not have sUkshma (subtle) and sthUla (gross) state as in the five elements of material world is an obstacle. This divine matter is said to be made of pancha upanishadh (unlike the matter in material world made of 5 elements - earth, water, fire, air, ether). So, they are not the same as matter seen in material world. Translator's note: It is explained that matter in material world covers the true nature of jIvAthmA and stimulates ignorance in jIvAthmA. But the divine matter of paramapadham facilitates knowledge and brings out more bliss for jIvAthmAs who are there. Not knowing that bhagavAn's divine forms are made of this divine matter (which is made of pancha upanishadh) is an obstacle. Translator's note: bhagavAn's divine forms are usually explained under 5 categories - para, vyUha, vibhava, archai, antharyAmi. This is explained in detail in http://ponnadi.blogspot.in/2012/10/archavathara-anubhavam-parathvadhi.html. In all these cases, wherever there is a form for bhagavAn, we need to understand that it is made of divine matter. Starting with this point, the focus shifts to understanding Iswara thathvam (bhagavAn), his forms and divine attributes. Not knowing that such forms of bhagavAn reveal his 6 main qualities is an obstacle. These divine forms made of divine matter will reveal the true nature/qualities of bhagavAn and enhance our knowledge. The six main qualities are gyAnam (knowledge), balam (strength), vIryam (valour), aiswaryam (wealth, ability to control everyone), sakthi (power), thEjas (beauty/radiance). All other qualities of bhagavAn originate from these fundamental qualities. Translator's note: bhagavAn literally means one who has six qualities (as explained before) in full. Thus, srIman nArAyaNan, the possessor of these six qualities in full is the only one qualified to be called as bhagavAn. Any other personality who is called bhagavAn (such as parAsara bhagavAn, vyAsa bhagavAn, etc) it is only said as a complimentary praise - not in the real sense - because no one else possesses these qualities in full. The divine forms of bhagavAn truly manifest his underlying qualities. Not knowing that though bhagavAn and nithyasUris are of the same class (eternally free AthmAs), bhagavAn's forms are categorically extraordinay due to the radiant nature of the same is an obstacle. ananthan, garudAzhwAr, vishwaksEnar, etc., are eternally free personalities. There is no difference amongst them as seen in material world by varNam, etc. Their forms are extraordinary too. Since their bodies/forms are made of divine matter, they will be variegated based on the kainkaryam (service) they perform. For example, ananthan assumes the form of a serpent, garudan assumes the form of a bird and vishwaksEnar assumes the form of a human. There is also gajamuka (elephant-headed person), simhamuka (lion-headed person), Male servants, Female servants, etc. But one should note that there is no male-female relationships (focussed on bodily attraction, etc) in paramapadham as seen here in samsAram. Translator's note: For specific kainkaryams, nithyasUris can and will assume different forms. As we have already seen before all "matter" in paramapadham is divine and is very much unlike "matter" that is seen in samsAram. Also, one should understand that nithyasUris are distinct from bhagavAn - while nithyasUris are jIvAthmAs, bhagavAn is paramAthmA. It is by the divine will of bhagavAn, nithyasUris are eternally free. bhagavAn's form is explained in chAndhOgya upanishadh as glowing most radiantly and a wonderful golden form. Not knowing that bhagavAn's forms during his avathArams (varAha, narasimha, srI rAma, krishNa, etc) are also made of divine matter (as in paramapadham), not knowing that siva, etc., acquired their (material) forms/bodies based on bhagavAn's divine will and considering bhagavAn's divine forms as made of "normal matter" are obstacles. His archAvathAram forms are called ichchgruhItha aprAkrutha dhivya mangaLa vigrahams - those divine auspicious forms that were assumed by him out of his desire. Though these forms look human-like, they are not made of the same matter. Translator's note: In the 4th chapter of bhagavadh gIthA, we have already seen bhagavAn revealing his avathAra rahasyam in many slOkams. He himself says in bhagavath gIthA 4.9 - "janma karma cha mE dhivyam" (ஜந்ம கர்ம ச மே திவ்யம்) - my birth and activities are divine. bhagavAn himself says in gIthA 9.11 "avajAnanthi mAm mUdA..." (அவஜாநந்தி மாம் மூடா) - foolish men who dont understand my supremacy consider me human (during my avathArams) and insult me. piLLai lOkAchAryar, in his srIvachana bhUshaNa dhivya sAsthram, explains bhagavath apachAram in detail in sUthrams 303 and 304. Among those, considering bhagavAn's avathArams are mere mortal forms is explained as an apachAram. While bhagavAn assumes these divine forms purely based on his will and desire, other dhEvathAs like brahmA, rudhran, indhran, etc., are posts that are assumed by jIvAthmAs who have performed many virtuous activities. So, it is based on their karmA and bhagavAn's will that allows jIvAthmAs to take up such powerful positions in the material world. Not knowing that all chith (jIvAthmAs - souls) and achith (matter) make up bhagavAn's body is an obstacle. As explained in "sarvam vishNumayam jagath" (ஸர்வம் விஷ்ணுமயம் ஜகத்) - everything in universe is pervaded by vishNu, whatever we see/hear, bhagavAn is the antharAthmA - so everything is the body of srIman nArAyaNan. Translator's note: We have seen this already from nArAyaNa sUktham "anthar bahischa thath sarvam vyApya nArAyaNa sthitha:" (அந்தர் பஹிஸ்ச தத்ஸர்வம் வ்யாப்ய நாராயணஸ்தித:) and srI rAmAyaNa slOkam "jagath sarvam sarIram thE" (ஜகத் ஸர்வம் சரீரம் தே). vishNu means one who pervades every where - so srIman nArAyaNan is the in-dwelling super-soul of all entities. We will continue with the next part of this section in the next article. Please see the previous article at http://ponnadi.blogspot.in/2014/10/virodhi-pariharangal-39.html. Most of these subjects require deep knowledge which is acquired through systematic study of sAsthram. To have full and in-depth understanding, it is best to learn these principles with the guidance of scholars. Not knowing that there is no other thathvam other than thathva thrayam (bhOkthru - enjoyer - soul, bhOgya - enjoyed - matter and niyanthru - controller - bhagavAn) is an obstacle. sruthi says "bhOkthA, bhOgyam, prErithAram cha mathvA" (போக்தா, போக்யம், ப்ரேரிதாரம் ச மத்வா). bhOgyam - that which is enjoyed. bhOkthA - one who enjoys. prErithA - one who has bhOgyam and bhOkthA as his property and one who controls those two. Thus, these are the 3 truths. The fundamental principle of emperumAnAr (srI rAmAnuja) dharsanam is to accept thathva thrayam (the three truths) as the only doctrine. The body is achith - matter - enjoyed. The one who resides inside the body and one who experiences the pleasures and pain is called chith - jIvAthmA - soul. The one who has both achith and chith as his body and controls them is sarvEsvaran (srIman nArAyaNan). One must have firm faith that there is nothing beyond these 3 real entities. One who have clarity and firm faith in this doctrine will never accept the doctrines of other schools of philosophy. Nor, he will be bewildered hearing others' philosophies. Subsequently, the philosophies of different mathams (schools) are explained and it is also explained that getting confused with such philosophies is by itself an obstacle for our spiritual progress. Translator's note: emperumAnAr have explained the essence of vEdhAntham in srI bhAshyam (commentary for brahma sUthram) and his other granthams such as vEdhArtha sangraham, vEdhAntha dhIpam, etc. nammAzhwAr's dhivya prabhandhams (thiruviruththam, thiruvAsiriyam, periya thiruvanthAdhi and thiruvAimozhi) are greatly glorified as the essence of vEdham. Among these, thiruvAimozhi is the most celebrated prabhandham. There are 5 vyAkyAnams for thiruvAimozhi namely 6000 padi written by thirukkurugaippirAn piLLAn, 9000 padi written by nanjIyar, 24000 padi written by periyavAchAn piLLai, eedu 36000 padi documented by vadakku thiruvIdhi piLLai as heard in lectures from nampiLLai, 12000 padi written by vAdhi kEsari azhagiya maNavALa jIyar. Among these, eedu 36000 padi stands out as the most elaborate and comprehensive commentary. For nampiLLai's eedu vyAkyAnam, there are two arumpadhams (further detailed explanations) namely appu arumpadham and jIyar arumpadham. nampiLLai gives 3 introductions for this eedu vyAkyAnam bringing out various wonderful principles in each introduction. In the first introduction named "mudhal sriya:pathi" (first sriya:pathi), he first explains that nammAzhwAr was blessed by bhagavAn himself with divine knowledge about the truth. Before explaining our sidhdhAntham, he first highlights the different philosophies and their limitations. He starts with explaining how different philosophies understand the thathvams (realities/truths). He discusses 17 such philosophies and discard them all as contradictory to vEdham. He finally establishes that vEdhAntham explains thathva thrayam (3 entities) only. piLLai lOkAchAryar has explained these 3 entities (chith, achith, Iswara) in a detailed manner in a rahasya grantham (confidential literature) named "thathva thrayam". This grantham is called as "kutti bhAshyam" (chOtA/small srI bhAshyam) as it brings out the essential aspects of sidhdhAntham that are explained by srI rAmAnuja in srI bhAshyam (which is a commentary for vEdhAntha sUthram). mAmunigaL has written a magnificient vyAkyAnam (commentary) for this grantham in which he brings out the most complicated subjects of vEdhAntham in the most eloquent manner. Over the course of this topic, we will be discussing various aspects from nampiLLai's first sriya:pathi and piLLai lOkAchAryar's thathva thrayam with mAmunigaL's vyAkyAnam. Being bewildered that there are 6 thathvams (starting with dhravyam) as explained by vaisEshika is an obstacle. We have already seen that our sidhdhAntham is based on thathva thrayam (3 thathvams). sAnkya, vaisEshika, pAsupatha, chArvAka, baudhdha, jaina are various schools of philosophies. One should not hear such philosophies and be bewildered that "can they be real?". One who has understood emperumAnAr (srI rAmAnuja) dharsanam will not falter on seeing any of these philosophies. All these philosophies need to be discarded. Our emperumAnAr is glorified as "aRusamayach chediyathanai adiyaRuththAn vAzhiyE, adarnthuvarum kudhruttigaLai aRaththuRanthAn vAzhiyE" (அறுசமயச் செடியதனை அடியறுத்தான் வாழியே, அடர்ந்துவரும் குத்ருட்டிகளை அறத்துறந்தான் வாழியே) - Long live srI rAmAnuja who is the one who destroyed the plant of shaN matham (6 philosophies - that are outside and contradictory to vEdham), Long live srI rAmAnuja, the one who eliminated the weeds - kudhrushti mathams (the philosophies that accept and misinterpret vEdham). His thirunakshathra (birth) day is glorified as "sankara bhAskara yAdhava bhAtta prabhAkarar thangaL matham chAyvuRa vAdhiyar mAyguvarenRu chathumaRai vAzhnthidu nAL" (சங்கர பாஸ்கர யாதவ பாட்ட ப்ரபாகரர் தங்கள் மதம் சாய்வுற வாதியர் மாய்குவரென்று சதுமறை வாழ்ந்திடு நாள்) - The day on which 4 vEdhams flourished happily seeing the matham (school of philosophy) of sankara, bhAskara, yAdhava prakAsa, bhAtta, prabhAkara, etc., were flattened and the debaters were defeated. We need not explain these philosophies in detail which are already eliminated. Being bewildered that there are 16 thathvams (starting with pramANam) as explained by naiyAyika (nyAya school) is an obstacle. Being bewildered that there are 25 thathvams (starting with mUla prakruthi) as explained by sAnkhya is an obstacle. Being bewildered that there 26 thathvams as explained by pathanjali is an obstacle. Being bewildered that there are 36 thathvams as explained by pAsupathan is an obstacle. Translator's note: pAsupatha is based on pAsupatha Agama which is focussed on rudhran. Being bewildered that there are 4 bhUthams starting with pruthvi (earth) are the thathvams as explained by chArvAkan is an obstacle. Translator's note: chArvAka is the one who simply accepts 4 elements (earth, water, fire and air) as reality. Basically, there is nothing beyond perception. chAru vAk means beautiful/flowery words. He tries to convince that just live this life as happily as possible since this is the only reality. He is also known lOkAyatha - gross materialist and one with atheistic philosophy. Being bewildered that truth is based on pancha skandha (five different groups), etc., as explained by baudhdha is an obstacle. Translator's note: 4 different types of baudhdha philosophies are explained in general. 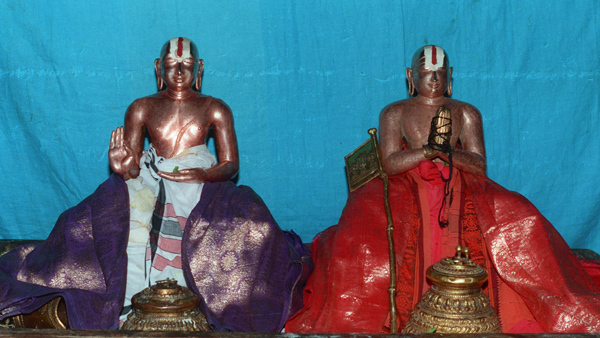 vaibhAshika, sauthrAnthika, yOgAchara and mAdhyamika are the 4 schools in budhdhist philosophy. Fundamentally, it is based on sUnyavAdham (complete voidness) - i.e., everything is nothing. Being bewildered that truth is based on dharma, adharma, etc., as explained by jaina is an obstacle. Translator's note: jaina philsophy focusses on ahimsA, renunciation, etc., without regard for vEdham and its principles. Being bewildered that jIvAthmA alone is the only thathvam as explained by mAyAvAdhis. Translator's note: mAyAvAdhis explain the presence of a singular AthmA (which is considered as brahmam) without any name, form, attributes, etc., and that AthmA is covered by ignorance which leads the AthmA to consider the illusory world as real. Once the ignorance is gone, the AthmA regains its true nature and that is liberation. Being bewildered with the philosophy of bhAtta and prabhAkara and considering that there is no separate existence of Iswara beyond jIvAthmAs is an obstacle. Translator's note: kumArila bhatta and prabhAkara were two staunch adhvaitha vEdhAntha philosophers. Starting now, many confusions regarding the achith thathvam (matter - insentient) are clarified and the misinterpretations are explained. We will first explain the principles of achith thathvam as established clearly by piLLai lOkAchAryar in his thathva thrayam grantham. Once we understand this, the obstacles will disappear themselves. No need for individual explanation. achith thathvam is of 3 categories. sudhdha sathvam (pure goodness), misra sathvam (mixed goodness) and sathva sUnyam (devoid of any goodness). Translator's note: All insentient objects (matter) is bound to have one or more of the 3 qualities namely sathvam (goodness), rajas (passion) and thamas (ignorance). Here, the objects themselves are called sudhdha sathvam, because they only have pure sathvam as their quality. The quality itself is different from the objects, but the object itself is named by its quality here. So, when we say sudhdha sathvam - it means the object that is filled with pure goodness. sudhdha sathvam is seen only in paramapadham. Translator's note: All matter in paramapadham are of sudhdha sathvam category. piLLai lOkAchAryar explains that sudhdha sathvam is devoid of any rajas and thamas and is totally pure. He explains that, this divine matter transforms itself into various maNdapams, gOpurams, vimAnams, prasAdhams, etc., in paramapadham and brings about unlimited bliss to bhagavAn, nithyas (eternally free souls) and mukthas (liberated souls). bhagavAn's divine archA forms that are seen in this material world also falls under sudhdha sathvam category only. misra sathvam is the mixture of sathvam, rajas and thamas and is seen in this samsAram (material world). Though achith (matter) is eternal, it undergoes constant changes. Hence, it is called as temporary. Though chith (jIvAthmA - soul) is filled with knowledge, when bound in a material body, the gyAnam (knowledge) and Anandham (bliss) that are intrinsic for the jIvAthmA - gets covered by achith (matter). This achith can also stimulate viparItha gyAnam (misunderstandings of reality). We will see this in great detail shortly. sathva sUnyam is kAlam (time). Translator's note: piLLai lOkAchAryar explains in thathva thrayam that kAlam is rejected by certain philosophers. But since we can understand the existence of kAlam through direct perception and sAsthram as well, there is no question of rejecting it. kAlam is explained as the factor that facilitates constant transformation of achith. It is explained as an instrument for bhagavAn's pastime. kAlam exists both in paramapadham (spiritual world) and samsAram (material world) - while it is fully submissive in paramapadham (exist fully for the pleasure of bhagavAn), it has the specific role to constantly control the activities of material world. mUla prakruthi (primordial matter) is the situation where all 3 qualities - sathvam, rajas and thamas are in absolute balance. This is a subtle state and is an entity which is body for bhagavAn. During srushti (creation), when that balance of qualities is changed, the subtle matter becomes gross matter with variegated forms and names. During srushti, prakruthi (matter) is the upAdhAna kAraNam (material cause). By the divine sankalpam (intention/desire) of bhagavAn, the subtle state becomes gross. Such change of state leads to the manifestation of 24 thathvams (entities). nammAzhwAr explains this in thiruvAimozhi 10.7.10 "pongaimpulanum poRiyainthum karumEndhriyam aimbhUtham ingivvuyirEy pirakiruthi mAnAngAra manangaLE" (பொங்கைம்புலனும் பொறியைந்தும் கருமேந்திரியம் ஐம்பூதம் இங்கிவ்வுயிரேய் பிரகிருதி மானாங்கார மனங்களே). Translator's note: As mentioned in sruthi, bhagavAn declares "bahu syAm" (பஹு ஸ்யாம்) -let me be many. With that vow, immediately he transforms the subtle primordial matter into many variegated gross forms. These 24 thathvams (entitities) of matter are explained as. AkAsa (ether), vAyu(air), agni (fire), Apa/jala (water), prthvi (earth). So far we have seen 20 elements. mahAn is the principle that facilitates efforts of jIvAthmA. ahankAram is the one that facilitates pride/regard for oneself. manas is the one that facilitates desires. Finally, with mUla prakruthi (primordial matter there are 24 achith elements. 25th thathvam is jIvAthmA and 26th thathvam is Iswara. When matter's qualities are equally distributed in sathvam, rajas and thamas, that state is called mUla prakruthi. When that balance gets disturbed, the effects will be visibly seen. When such equilibrium is lost, first mahAn appears. This is also called as mahath thathvam. We can relate to this similar to a seed being soaked in water sprouting. This mahath thathvam will be in 3 states - sAthvikam, rAjasam and thAmasam. From these 3 states of mahAn, 3 types of ahankArams namely vaikArikam, thaijasam, bhUthAdhi. ahankAram is the principle that subsides reality and brings about misunderstandings. For example, considering body and soul as the same is one such misunderstanding. Translator's note: piLLai lOkAchAryar explains these in thathva thrayam. mAmunigaL quoets various pramANams in his vyAkyAnam to establish the nature of the different aspects of matter. Generally, mUla prakruthi is explained as pradhAnam (chief/main state of matter), avyaktham (unmanifested state). When mUla prakruthi is transformed to mahath thathvam (mahAn) - matter becomes manifested with name, form, etc. Starting with mahAn, prakruthi goes on to expand into 23 thathavams altogether. From vaikArikam (sAthvika ahankAram), both karmEndhriyams (5 sense organs of action) and gyAnEndhriyams (5 sense organs of knowledge) are created and they exist in a subtle manner. manas (mind) also is a product of vaikArikam. From bhUthAdhi (thAmasa ahankAram), pancha bhUthams (five elements) are created. thaijasam (rAjasa ahankAram) assists vaikArikam and bhUthAdhi in their transformation. From bhUthAdhi, pancha thanmAthrAs (five objects of senses) which are the subtle aspect of pancha bhUthams (five gross elements) are created and their sequence is explained here. From bhUthAdhi, first sabdha thanmAthram (sound) appears. This is the subtle state of AkAsa (ether). From sabhda thanmAthram, Akasa and sparsa thanmAthram (touch) appear. From sparsa thanmAthram, vAyu and rUpa thanmAthram (vision) appear. From rUpa thanmAthram, thEjas (agni - fire) and rasa thanmAthram (taste) appear. From rasa thanmAthram, gandha thanmAthram (smell) and appu (water) appears. From gandha thanmAthram, pruthvi (earth) appears. Translator's note: In thaithriya upanishadh, this is explained as "AkAsAth vAyu:, vAyOr agni:, agniyair Apa:, abhya: pruthvi ..." (ஆகாசாத் வாயு:, வாயோர் அக்நி:, அக்ந்யைர் ஆப:, அப்ய: ப்ருத்வி) - From ether comes air, from air comes fire, from fire comes water, from water comes earth and so on. This process is generally explained as panchIkaraNam (mixture of 5 elements). Thus, as part of srushti, bhagavAn first creates the various universes using these 24 elements directly and once these universes are there, subsequent creation of the various species, etc., through brahmA indirectly. Translator's note: srushti is classified as adhvAraka srushti - direct creation by bhagavAn and sadhvAraka srushti - indirect creation by bhagavAn through brahmA, rishis, etc. Up and until the universes are created, it is all done by bhagavAn directly. Once the universes are there, he first creates one brahmA for each universe and guides him in subsequent creation with in the universe. brahmA, saptha rishis, manu, etc., are all engaged in procreation that leads to the variegated species and forms that are seen in the universe. It is explained that there are innumerable such universes and each universe is headed by a brahmA. Thus, we can understand that the material world itself is so huge that is beyond our imagination. And paramapadham is generally explained as thripAdh vibhUthi (3 parts - 3 times larger than samsAram). Also, the srushti we see is also a cyclical one. There is srushti (creation), sthithi (sustenance) and samhAram (annihilation). This cycle has been going on since time immemorial - there is no beginning for this cycle - nor there is an end. With this introduction we can continue with the remaining obstacles highlighted in this section. Being bewildered that AvaraNa abhAvam (boundary-less state) is AkAsam (ether) and considering it to be eternal, indivisible and all-pervading is an obstacle. AkAsam is one among the pancha bhUthams (five elements) which is created as part of srushti. Thus it cannot be considered eternal, indivisible, etc. Being bewildered that dhik (direction) is a separate material is an obstacle. Directions like East, West, etc., are not separate material. For some one in chennai, srIrangam is in the south. But for some one in AzhwAr thirunagari, srIrangam is in the north. So, it is relative. Translator's note: mAmunigaL highlights in thathva thrayam 127th sUthram vyAkyAnam that vaisEshikas, etc., explain dhik (direction) as a separate element like pruthvi (earth). More can be learnt from learned scholars on these matters. Being bewildered that kAlam (time) does not exist is an obstacle. kAlam is represented as nimisha, maNi, muhUrtham, etc. It is based on the change of time, all changes occur in this world. "kAlO hi dhurathikrama:" (காலோ ஹி துரதிக்ரம: - The effect of time is inevitable) is a well-known phrase. Translator's note: mAmunigaL highlights in thathva thrayam 125th sUthram vyAkyAnam that baudhdha, etc., does not accept the existence of kAlam. In the next sUthram, piLLai lOkAchAryar highlights that since kAlam can be understood from both perception and sAsthram, such principle negating the existence of kAlam cannot be accepted. mAmunigaL quotes beautiful examples and establishes the same principle in the vyAkyAnam for that sUthram. Being bewildered that vAyu cannot be perceived is an obstacle. Though vAyu (air) is not seen, its presence can be felt by the touch sensation, it cannot be explained as aprathyaksham (imperceptible). Please see the previous article at http://ponnadi.blogspot.in/2014/09/virodhi-pariharangal-38.html. We are continuing with this topic now. Most of these subjects require deep knowledge which is acquired through systematic study of sAsthram. To have full and in-depth understanding, it is best to learn these principles with the guidance of scholars. Not having desire for mOksham that leads to boundless eternal kainkaryam in paramapadham is an obstacle. In the previous point, we saw the need for giving up attachment towards temporary insignificant worldly pleasures. Here, mOksham is explained as anantha (boundless) sthira (permanent/eternal) result. Not having desire for such goal is an obstacle. As explained in "mukthir mOksha: mahAnandha:" (முக்திர் மோக்ஷ: மஹாநந்த:), mOksham is boundless and eternal bliss. For the one who was liberated, there is no rebirth. Translator's note: chAndhOgya upanishadh declares "na cha punar AvarthathE, na cha punar AvarthathE" (ந ச புநர் ஆவர்த்ததே, ந ச புநர் ஆவர்த்ததே) - there is no returning back. Saying it twice is to emphasise/re-inforce the principle strongly. kaNNan emperumAn also explains in gIthA 8.16 "A brahma bhuvanAth lOkA: ..." (ஆ ப்ரஹ்ம புவநாத் லோகா:) - from brahma lOka - the top most location to the lowest location there is repeated birth/death, but one who reaches him, there is no re-birth in (returning back to) the material world. This is the unique nature paramapadham - once some one reaches there, the jIvAthmA is fully purified and the knowledge is fully expanded. So, there is no possibility of returning to samsAram. One continues to serve bhagavAn in paramapadham in various ways assuming various forms. This is explained in chAndhOgya upanishadh "sa EkathA bhavathi, thrithA bhavathi, ..." (ஸ ஏகதா பவதி, த்ரிதா பவதி, ...) - He can take one form, 3 forms, etc. There is no end for this bliss and thus there is no real possibility of the jIvAthmA returning to the material world after having tasted such bliss which is natural for him. bhagavAn also would not send the jIvAthmA back to samsAram having himself made so much effort to bring him over to paramapadham. So, one should desire for this eternal kainkaryam to bhagavAn in paramapadham. Being a mumukshu, not having jihAsA (distaste) for samsAram (material world) is an obstacle. mumukshu means one who desires for mOksham. As demonstrated by nammAzhwAr in thiruviruththam 1st pAsuram "inninRa nIrmai iniyAm uRAmai" (இந்நின்ற நீர்மை இனியாம் உறாமை) - I cannot withstand my current situation of being caught in this samsAram, one should have great dislike for the life in this material world. To overcome that, one should have great desire to reach paramapadham. This is explained as "samsAraththil adikkodhippu" (ஸம்ஸாரத்தில் அடிக்கொதிப்பு) - being in material world is like walking on burning hot sand. Translator's note: When one is caught walking on sand, he/she will look for shade in great hurry. samsAram is compared to burning hot sand and paramapadham is explained as cool shade. bhagavAn himself is also explained as "vAsudhEva tharu chAyA" (வாஸுதேவ தருச் சாயா) - vAsudhEva, the shade giving tree. piLLai lOkAchAryar explains srIvaishNava lakshaNam in mumukshuppadi sUthram 116 (first sUthram of dhvaya prakaraNam). In there, among several qualities, he identifies that a vaishNava should be fully confident of reaching paramapadham to perform eternal kainkaryam. At the same time, he should also greatly crave/long for that goal as well constantly. One should not be simply satisfied in whatever situation one is in and happily leading his/her life. Rather there should be constant desire to be relieved from suffering in this material world and to be situated in paramapadham to be serving bhagavAn there eternally. Not having such intention is an obstacle. Without understanding that anything achieved through ones karmA will be temporary and insignificant and not desiring to learn about brahmam being positive is an obstacle. karma sAdhya palam - whatever is accomplished through yAgam, yagyams, etc., such as wordly wealth, pleasures in svargam (heaven), etc. These are temporary - will end once the puNyam (virtue) is exhausted. They are not eternal. When compared to the eternal blissful kainkaryam in paramapadham, these are insignificant. It is a pitiful state for the ones who do not seek out for bhagavadh kainkaryam even after understanding the limitations of such worldly pleasures. Translator's note: In bhagavadh gIthA 8.15, kaNNan emperumAn explains "mAmupEthya punarjanma dhukkAlayam asAsvatham ..." (மாமுபேத்ய புநர்ஜந்ம துக்காலயம் அசாச்வதம் ...) - Ones who attain the highest result of reaching me (to perform eternal kainkaryam in paramapadham) will be fully relieved from this material body (in material world) which is the abode of all sorrows (dhukkAlayam) and temporary (asAsvatham). Any where in this material world, from pAthALa lOkam (the lowest of planets) to the brahma lOkam (the highest of planets), the problem of janma (birth), mruthyu (death), jarA (Old-age), vyAdhi (disease) exists. With the existence of these 4 main problems, there is always the possibility for sorrow. Thus, one should give up the attachment towards insignificant material aspects and aim for eternal blissful kainkaryam (service) to bhagavAn in paramapadham. Not knowing that nArAyaNa who is revealed in nArAyaNa anuvAkam (sUktham) is the one who is indicated by the word "brahma" is an obstacle. In nArAyaNa sUktham, we see "nArAyaNa param brahma thathvam nArAyaNa: para: nArAyaNa parOjyOthi: AthmA nArAyaNa: para:" (நாராயண பரம் ப்ரஹ்ம தத்வம் நாராயண: பர: நாராயந பரோஜ்யோதி: ஆத்மா நாராயண: பர:). Here it is declared in sruthi that the supreme lord who is known as nArAyaNa is the parabrahmam (supreme brahmam) who has none equal to him. This is to learnt and understood by everyone. Not knowing that karma bhAgam of sAsthram is established by bhagavAn himself to be followed by everyone is an obstacle. vEdham is divided into 2 parts. karma bhAgam explains about the yAgam (sacrifice), yagyam (worship), etc. karmAs are of two types. AgyA karmams - nithya (daily), naimiththika (periodic) karmams. These (nithya/naimiththika) karmams have to be done. akaraNE prathyavAyam - when such karmam is not performed it leads to sins. There is also another type of karmam called kAmya karmam - these are optional and focussed on material benefits generally. We perform our daily karmams with the sankalpam "srI bhagavadh AgyA bhagavath kainkaryam rUpam" - karmam ordained by bhagavAn and is part of bhagavath kainkaryam. Translator's note: mAmunigaL explains the principle of division of vEdham into two parts - pUrva (first) bhAgam and uththara (subsequent) bhAgam in his commentary for 1st sUthram of piLLai lOkAchAryar's srIvachana bhUshaNa dhivya sAsthram. He highlights that pUrva mImAsA (jaimini sUthram) with "athAthO dharma jijnAsa" and uththara mImAmsA (vEdha vyAsa's brahma sUthram) starts with "athAthO brahma jijnAsa". So, pUrva bhAgam is focussed on explaining the method of worshipping brahmam through karmAnushtAnams and uththara bhAgam is focussed on explaining the qualities of such brahmam which is worshipped. He also highlights thaithriaya upanishadh "sa AthmA, angAnyanyA dhEvathA:" to establish that all dhEvathas are bodies of bhagavAn and are sustained by bhagavAn. Knowing this, learned scholars will engage in karmAnushtAnams purely as worshipping of bhagavAn (as ordained by bhagavAn himself). His commentary for this section is really detailed and lengthy - but it is a wonderful analysis/presentation of the fundamental principles of our sath sampradhAyam which is to be studied under the proper guidance of learned scholars. Not knowing that brahma bhAgam of vEdham explains in detail his svarUpa (true nature), rUpa (forms), guNa (qualities), vibhava (avathArams), etc., and completes with attaining him fully is an obstacle. brahma bhAgam - upanishadhs. These explains the supreme lord srIman nArAyaNan's true nature, forms, qualities, avathArams, etc. svarUpam means true nature - supremacy, omni-presence, etc. rUpam means beauty of his divine form, tender nature, etc. guNam includes all of his most auspicious qualities - qualities that highlight his supremacy such as gyAnam, sakthi, etc., and qualities that highlight his simplicity such as easy appraoachability, mixing freely with everyone, motherly forbearance towards others, etc. vibhavam, etc., includes his avathArams, unlimited wealth, etc. Once a person understands these (svarUpa, rUpa, guNa, vibhava, etc), he/she will develop the desire to attain him and will investigate about the means to attain him. Translator's note: Here brahma bhAgam includes upanishadhs and brahma(vEdhAntha) sUthram. vEdhAntha sUthram is one of the most important literature that establishes the qualities of brahmam clearly. bOdhAyana rishi originally wrote a commentary for brahma sUthram which was preserved in kashmir. srI rAmAnuja vowed to write a detailed commentary for the same to establish the visishtAdhvaitha philosophy per the desire of ALavandhAr (yAmunAchAryar). To fulfill that vow, he traveled all the way to kashmir along with kUrathAzhwAn, acquired the bOdhAyana vruththi grantham and begun his journey back to srIrangam. Some miscreants heard about this, they tracked down srI rAmAnuja and took the vruththi grantham away. srI rAmAnuja was filled with grief and sorrow, but kUrathAzhwAn reveals to srI rAmAnuja that he has already memorized the whole grantham during the time srI rAmAnuja was resting. They return to srIrangam and srI rAmAnuja completes the srI bhAshyam (detailed commentary for brahma sUthram) with the help of kUrathAzhwAn. srI rAmAnuja then returns to kashmir and saraswathi dhEvi welcomes him with great joy at shAradhA pItam. She accepts the bhAshyam from him and glances through the same. Overjoyed with the great clarity of the literature, she honors srI rAmAnuja with the title "srI bhAshyakAra". For upanishadhs, srI rAmAnuja did not write any separate commentary. He lectured vEdhArtha sangraham in front of srInivAsa (thiruvEnkatamudaiyAn) spontaneously. In this vEdhArtha sangraham, he specifically addresses the aspects of upanishadhs that are mis-interpreted by adhvaithis. Phrases such as thathvamasi, aham brahmAsi, etc., which are mis-interpreted by adhvaithis and such phrases are clearly explained with proper context in relation to various other pramANams by srI rAmAnuja in vEdhArtha sangraham. Thus, we can understand the wonderful aspects of brahmam through these great works of srI rAmAnuja in a pristine manner without an iota of doubt/confusion. Not understanding that kainkaryam (in parampadham) is the ultimate goal is an obstacle. To reach srIman nArAyaNan is the parama purushArtham (supreme goal). bhagavadh anubhavam (bliss of experiencing bhagavAn) is the first step in this goal. Such experience leads to prIthi (love towards bhagavAn) knowing his wonderful qualities. Such love will lead us to kainkarayam (serving him) for his pleasure. Translator's note: As said in "akinchithkarasya sEshathva anupapaththi:" (அகிஞ்சித்கரஸ்ய சேஷத்வ அநுபபத்தி:) - ones true nature of servitude can only be sustained by engaging in (atleast) small kainkaryams (devotional service). vEdhAntham explains liberation as becoming situated in ones proper svarUpam of servitude. sEshathvam is the main quality of AthmA. That sEshathvam must lead to selfless kainkarayam purely for the pleasure of bhagavAn. Any other understanding about the ultimate goal is simply a misunderstanding. Not knowing that sAmyApaththi (jIvAthmA attaining an equal level of brahmam) is only indicated in the sense of sAmarasyam (having equal joy) is an obstacle. In sruthi, mOksham (liberation) is explained as "paramam sAmyamupaithi" (பரமம் ஸாம்யமுபைதி), "sOsnuthE sarvAnkAmAn sahabrahmaNA" (ஸோச்நுதே ஸர்வாந்காமாந் ஸஹப்ரஹ்மணா), etc. Specifically, there will be equality in gyAnam (knowledge) and Anandham (bliss) among bhagavAn, nithyasUris (eternally free souls) and mukthAthmAs (liberated souls). Still, bhagavAn is the swAmy (owner) and all other jIvAthmAs (souls) are his servants. Translator's note: The real benediction for the jIvAthmA is to reach emperumAn. For the ones who reach him, he blesses him with sAmyApaththi mOksham as identified by thirumangai AzhwAr in periya thirumozhi 11.3.5 - "thammaiyE okka aruL cheyvar" (தம்மையே ஒக்க அருள் செய்வர் - bhagavAn will bless the mukthAthmA to have his qualities). sAmyApaththi mOksham means mukthAthmA acquiring eight qualities by the grace of bhagavAn. These qualities are present in bhagavAn fully. But beyond these eight qualities there are certain qualities like sriya:pathithvam (being the husband of srI mahAlakshmi), sEsha sAyithvam (the one lying on Adhi sEshan), ubhaya vibhUthi nAthathvam (being the controller of both nithya vibhUthi and leelA vibhUthi), etc., which are unique to bhagavAn alone. The eight qualities are: apahathapApmA - being free from any sins, vijara: - being free from old age, vimruthyu: - being free from death, visOka: - being free from sorrows, vijigathsa: - being free from hunger, apipAsa: - being free from thirst, sathyakAma: - able to fulfill all desires, sathyasankalpa: - able to complete any task. Assuming svarUpa aikyam (merging of paramAthmA and jIvAthmA) is an obstacle. As explained in previous point, the principle of jIvAthmA becoming brahmam that is put forward by adhvaithis is merely an illusion. Not knowing that one can/will assume many different forms to perform kainkaryam for bhagavAn after liberation and being in illusion that there is no form/body after liberation are obstacles. We should understand that kainkaryam is the ultimate goal for the mukthAthmA. To perform kainkaryam, jIvAthmA needs a physical form/body. poigai AzhwAr explains in mudhal thiruvanthAdhi 53rd pAsuram "chenRAl kudaiyAm irunthAl chingAchanamAm ninRAl maravadiyAm ..." (சென்றால் குடையாம் இருந்தால் சிங்காசனமாம் நின்றால் மரவடியாம் ...) - When bhagavAn walks Adhi sEshan assumes the form of an umbrella, when bhagavAn sits Adhi sEshan becomes the throne, when bhagavAn stands Adhi sEshan becomes the sandals, etc. So Adhi sEshan (who is a nithyasUri - eternally free jIvAthmA) assumses the forms of umbrella, sandals, throne, bed, etc., and performs many kainkaryams. Similarly, mukthAthmAs (liberated souls) too engage in many kainkaryams assuming different forms. How can one perform kainkaryam without a body? Translator's note: In the vyAkyAnam for this pAsuram, nampiLLai beautifully identifies that Adhi sEshan will take any form to please srI mahAlakshmi and srIman nArAyaNan. He also goes on to highlight that though only Adhi sEshan is mentioned in this pAsuram, it is done as upalakshaNam (analogy/example) for all jIvAthmAs in paramapadham. We have already seen the pramANam from chAndhOgya upanishadh "sa EkathA bhavathi, thrithA bhavathi, ..." (ஸ ஏகதா பவதி, த்ரிதா பவதி, ....). Not knowing that liberation means travelling via archirAdhi mArgam (the route which starts with archis) that ultimately leads to paramapadham and being illusioned with jIvan mukthi (being liberated in the current life and in this samsAram itself) is an obstacle. Real mukthi/mOksham (liberation) means being relieved from the cycle of birth/death in this samsAram, reaching paramapadham, experiencing paravAsudhEvan emperumAn and serving him eternally, all the time without any blemish for his full pleasure. jIvAthmA (one who is to be liberated) leaves his body at the time of death, and travels through archirAdhi mArgam which is a brightly lit/shining route being assisted by bhagavAn himself and reaches paramapadham. This end state is called as "mukthir mOksha: mahAnandha:" - blissful liberation. In sankara's adhvaitha philosophy, learning the meaning of phrases in vEdhAntham such as "thathvamasi" and understanding that "the self is bhramam only" is considered as liberation. In this life itself, one becomes liberated according to adhvaitha philosophy. But such understanding is confusing and simply hallucination. Translator's note: archirAdhi mArgam is explained by nammAzhwAr in thiruvAimozhi 10.9 padhigam (decad) - "sUzhvisumbaNimugil". archirAdhi mArgam and the blissful experience in paramapadham is explained in detail by piLLai lOkAchAryar in a rahasya grantham called "archirAdhi". piLLai lOkAchAryar himself highlights in mumukshuppadi 27th sUthram that the ultimate result of serving bhagavAn in paramapadham is explained in pramEya sEkaram and archirAdhi gathi (two amongst his 18 rahasya granthams). nAyanAr reveals nammAzhwAr's divine emotions towards thirumOgUr Apthan emperumAn as the one who accompanies the jIvAthmA through the archirAdhi gathi - the route that leads the jIvAthmA to the mOksha bhUmi (paramapadham - the land of liberated souls). Apthan means trustworthy person - he is to be trusted that he will lead us to paramapadham safely. Not knowing that even though ones karmAs are extinguished at the end of this life as a prapanna, the sUkshma sarIram (the subtle body) will travel along with the jIvAthmA and that will only be ridden after dipping in virajA river and having any doubts in that is an obstacle. Though by the grace of bhagavAn one's karmAs (virtues/vices) are eradicated at the end of his/her life and travels through the archirAdhi gathi, the jIvAthmAs connection to achith (matter) is not completely eradicated since the sUkshma sarIram (subtle body) is still attached to the jIvAthmA. This according to the sankalpam of bhagavAn. At the border of parampadham (separating paramapadham and samsAram), there is a divine river called virajA. The jIvAthmA takes a dip in this river and bhagavAn in the form of "amAnavan" holds the hands of jIvAthmA and lifts him up. It is by this merciful touch, the subtle material body is also completely cut off - until then there is connection to material world. According to "total eradication of material aspects will lead to full removal of ignorance", the jIvAthmA will have his knowledge full expanded at that time. Translator's note: sthUla sarIram (gross body) - made of pancha bhUtham (five elements - earth, water, air, fire, space). sUkshma sarIram (subtle body) - mind, vAsanA/ruchi (traces/taste) from previous experiences. mAmunigaL explains this point beautifully in the vyAkyAnam for AchArya hrudhayam 104th chUrNikai. This chUrNikai beautifully establishes how bhagavAn puts in so many efforts in bringing a jIvAthmA who is engrossed in samsAram to fully serve him in paramapadham. In this chUrNikai, nAyanAr uses the example of a farmer who works hard in the field to get the harvest he wants. One of the points in this chUrNikai explains "sUkshmavottum nIrilE kazhuvi" (ஸூக்ஷ்மவொட்டும் நீரிலே கழுவி) - here nAyanAr uses the example of "paddy being washed in water to remove the subtle dirt" to explain how jIvAthmA is washed in virajA river's sacred water to remove the subtle body. Here mAmunigaL raises a wonderful question - when jIvAthmA's karmA is fully eliminated, why is there a need for the subtle body consisting of vAsanA (traces of material desires), etc? He himself answers that it was bhagavAn's sankalpam to carry the subtle body upto virajA river since for a jIvAthmA to travel (any action for that matter), a body is required. So, the subtle body is retained by bhagavAn until the jIvAthmA reaches viarjA river. mAmunigaL quotes previous AchAryas words to firmly establish this principle also. Once the jIvAthmA dips in the virajA, this subtle body is washed away and he is given a spiritual body by the touch of amAnavan (this is also explained by nAyanAr in the same chUrNikai). Here it is important for us to recollect eRumbi appA's pAsuram of "mannuyirgAL ingE maNavALa mAmunivan ponnadiyAm sengamalap pOdhugaLai unnich chiraththAlE thINdil amAnavanum nammaik karaththAlE thINdal kadan" (மன்னுயிர்காள் இங்கே மணவாள மாமுனிவன் பொன்னடியாம் செங்கமலப் போதுகளை உன்னிச் சிரத்தாலே தீண்டில் அமானவனும் நம்மைக் கரத்தாலே தீண்டல் கடன்) - Oh, the ones who are firmly placed here! for the ones who faithfully touch the lotus feet of maNavALa mAmunigaL with their head, amAnavan will be duty-bound to touch us (to elevate us to paramapadham). This pAsuram is recited at the end of mAmunigaL's upadhEsa raththina mAlai. Being in awe of bhakthi yOgam which is explained as a means for reaching bhagavAn after being relieved from samsAram and not knowing that prapaththi is the real means to reach bhagavAn is an obstacle. There are many means explained in sAsthram for liberation (eternal kainkaryam in paramapadham). It is explained in gIthA that bhakthi yOgam which is ordained in sAsthram as a superior means to reach emperumAn. But since this bhakthi yOgam is fundamentally dependent on the jIvAthmA's self effort, it is contrary to the true nature of jIvAthmA's natural qualities of sEshathvam (full servitude) and pArathanthriyam (total dependence). Thus our AzhwArs and AchAryas rejected bhakthi yOgam as a upAyam and only considered prapaththi (full surrender) which is natural for the jIvAthmA as the upAyam. It is apt for us to follow in the foot steps of our pUrvAchAryas. Not firmly clarifying/understanding that the word prapaththi directly indicates bhagavAn himself is an obstacle. prapaththi is saraNAgathi (surrender) - surrendering unto bhagavAn and accepting him as the refuge. Though it looks like "we" are holding on to him, that is not the truth. The real meaning of saraNAgathi is "thvamEva upAya bhUthO mE bhava - ithi prArthanA mathi:" (த்வமேவ உபாய பூதோ மே பவ இதி ப்ரார்த்தநா மதி:) - it is that mental state of praying "you only become my upAyam (means)". That is, in place prapaththi, bhagavAn (who is surrendered unto) himself becomes the upAyam. Since he is the upAyam, our (confused) thinking of "I am surrendering" is not upAyam (means). He is the only upAyam (means) and the only upEyam (goal). Thus it can be said that prapaththi itself indicates bhagavAn only. Translator's note: In gIthA charama slOkam, bhagavAn orders arjuna to give up all dharmams and surrender unto him only and he will free arjuna of all worries. piLLai lOkAchAryar beautifully explains this charama slOkam in mumukshuppadi. Here krishNa says "mAm Ekam saraNam" - Accept me as the only upAyam. piLLai lOkAchAryar gives elaborate explanation for the "Eka" word. Here he identifies that this "Eka" establishes that even the act of surrendering is not the upAyam and bhagavAn only is upAyam. This principle is most important to understand to get the fine principle of our sath sampradhAyam. In many sUthrams, Eka is explained in detail. One should listen to mumukshuppadi kAlakshEpam with mAmunigaL's beautiful vyAkyAnam to understand these principles clearly. Considering the act of surrender which is adhikAri visEshaNam (an attribute of a qualified person) as upAyam is an obstacle. As explained in previous point, the act of surrender is merely a quality of the person who desires mOksham - nothing more. Confusing it to upAyam is not appropriate. Translator's note: adhikAri visEshaNam means that attribute which identifies the person uniquely. Here adhikAri is the one who "desires" for mOksham - for such jIvAthmA, the act of surrender is truly natural since being surrendered to bhagavAn is the true nature of jIvAthmA. In mumukshuppadi sUthram 55, piLLai lOkAchAryar declares "sEshathvamE AthmAvukku svarUpam" (சேஷத்வமே ஆத்மாவுக்கு ஸ்வரூபம்) - being subservient to bhagavAn is the only true nature of jIvAthmA. mAmunigaL establishes that the jIvAthmA is a servant and srI hari is the master using many pramANams beautifully. In the next sUthram, he says "sEshathvamillAdhapOdhu svarUpamillai" (சேஷத்வமில்லாதபோது ஸ்வரூபமில்லை) - when there is no sEshathvam, that true nature is lost. So, according to the true nature of the jIvAthmA, surrendering to bhagavAn is only a natural activity - it cannot be considered as specific means. Here is a good example heard in kAlakshEpams to explain this principle. A philanthropist is distributing food freely in his home. Some one comes there he wants to eat. Here the upAyam (means) for the food is philanthropist's compassionate gesture of feeding all. But for the one who wants to eat there, he must have "hunger" - this hunger is adhikAri visEshaNam - without the hunger, he will not be able to really eat the food that is distributed. But this hunger is not the upAyam (means) - it is only an intrinsic attribute of any one wanting to eat. Surrendering without purushakAram is an obstacle. purushakAram generally means recommendation. It is the act of convincing bhagavAn to be the upAyam for our upliftment. Since we are filled with kruthya akaraNam (not fulfilling commandments of sAsthram), akruthya karaNam (engaging in activities that are prohibited in sAsthram), bhagavadhapachAram (offenses towards bhagavAn), bhAgavatha apachAram (offenses towards his devotees), etc., bhagavAn may reject us. The divine mother srI mahAlakshmi convinces him to accept us inspite of our defects and facilitates his protection towards us. This is the main meaning of purushakAram. It can be said that any surrender without the purushakAram is doomed to fail. Translator's note: srI mahAlakshmi thAyAr's role as purushakAram is explained in detail by our pUrvAchAryas. In his saraNAgathi gadhyam, emperumAnAr first approaches thAyAr and then surrenders to emperumAn. dhvaya mahA manthram is greatly glorified in our sath sampradhAyam since it highlights the role of thAyAr fully. In the first part of dhvayam, it is explained that srIman nArAyaNan should be surrendered with the purushakAram (recommendation) of thAyAr and he alone should be accepted as upAyam. In the second part, it is explained that the divine couple should be served together, purely for bhagavAn's pleasure. In mumukshuppadi, piLLai lOkAchAryar explains the role of thAyAr and her purushakAram nicely. piLLai lOkAchAryar explains in 135th sUthra that, her presence with srI rAma greatly helped kAkAsura who hurt her with ill-intentions and kAkAsura was ultimately saved due to her recommendation. But on the other hand, rAvaNa was killed by srI rAma since she was not accompanying srI rAma at that time. So, while surrendering to bhagavAn, her presence ensures that the jIvAthmA is fully accepted by bhagavAn and ignoring her purushakAram will lead to undesired results. While considering the AchArya, thinking about him simply as a purushakAram (recommendation authority) instead of svathanthra upAyam (independent means) is an obstacle. AchArya is generally explained as an assistant/servitor of thAyAr. AchArya too like thAyAr, is kind hearted, compassionate towards all without any interest in discarding any one. But, as explained in rAmAnusa nURRanthAdhi 95th pAsuram, "viNNin thalai ninRu vIdaLippAn emmirAmAnusan" (விண்ணின் தலை நின்று வீடளிப்பான் எம்மிராமானுசன்) - Having descended from paramapadham into this world, our mAster rAmAnuja benedicts liberation (independently), the AchArya can be an independent upAyam (means) as well. This is the essence of srIvachana bhUshaNa dhivya sAsthram as highlighted in sUthram 447 "AchArya abhimAnamE uththArakam" (ஆசார்ய அபிமானமே உத்தாரகம்) - AchArya's mercy is the ultimate benediction for our upliftment. Translator's note: AchArya is explained as an incarnation of bhagavAn himself. Please see http://ponnadi.blogspot.com/2013/06/anthimopaya-nishtai-12.html for full details on this topic. piLLai lOkAchArya explains in srIvachana bhUshaNa dhivya sAsthram 427th sUthram that approaching bhagavAn directly is like asking for his help holding his hands and approaching bhagavAn through AchArya is like asking for his help holding his lotus feet. AchAryas are considered as bhagavAn's lotus feet. Just like bhagavAn's lotus feet, AchAryas also have great compassion. Thus, they are considered as independent upAyam. Considering upAyam and upEyam as two different entities is an obstacle. Ultimate goal is to reach emperumAn in paramapadham and serve him eternally for his pleasure. To achieve this ultimate goal, he alone is the means. Thus, upAyam and upEyam is bhagavAn only. Having attachment towards persons belonging to different schools of philosophy which do not accept bhagavAn's jagath sarIrathvam (being the in-dwelling super-soul of all universes), etc., is an obstacle. nammAzhwAr explains in thiruvAimozhi 1.1.7 "udanmisai uyirenak karanthengum paranthuLan" (உடன்மிசை உயிரெனக் கரந்தெங்கும் பரந்துளன்) - just like the AthmA is spread throughout the body (through his gyAnam), bhagavAn (himself) is spread/present everywhere. Here emperumAn is present in every single entity in all the universes and everything is his body - this is visishtAdhvaitha sidhdhAntham. brahmA glorifies srI rAma greatly after rAvaNa's vanquishing. He firmly establishes srI rAma's supremacy by saying "sIthA lakshmI bhavAn vishNu:" (ஸீதா லக்ஷ்மீ பவாந் விஷ்ணு) - sIthA is srI mahAlakshmi and you are vishNu and "jagath sarvam sarIram thE" (ஜகத் ஸர்வம் சரீரம் தே) - the whole universe is your body. But kudhrushtis (ones who misinterpret sAsthram) do not accept these principles. Thus, we should not have friendship towards such persons. Translator's note: vishNu means one who is omni-present. vAsudhEva means one who lives everywhere. nArAyaNa means one who is the abode of everything and one who exists is everything as well. These 3 names of bhagavAn indicate his omni-presence. Him being the soul of everything establishes his jagath sarIrathvam. This is a very simple concept. Just like the AthmA, the soul has a body, paramAthmA has everything (that exists) as his body. The only difference in this analogy is - AthmA exists in one particular part of the body and is spread throughout the body through its knowledge (i.e., AthmA is not physically present in each and every part of the body) - this is because AthmA is aNu (miniscule) in nature. But paramAthmA is vibhu (great/all-pervading) - so he physically exist in each and every particle in this universe. This principle of vEdhAntham is not accepted by scholars of different schools and friendship with such persons might influence us adversely if we are not strong in the fundamentals ourselves. Thus it is recommended to avoid friendship with such persons.